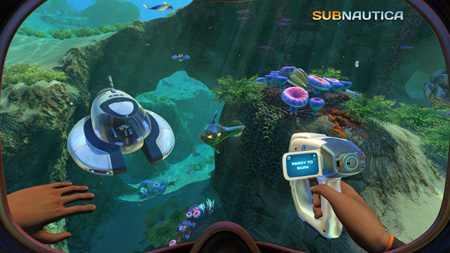 Subnautica is an open world, underwater exploration and adventure game by Unknown Worlds Entertainment. Your job is to descend into the depths of an alien underwater world filled with wonder and peril. Craft equipment, pilot submarines and out-smart wildlife to explore lush coral reefs, volcanoes, cave systems, and more. The ocean is unforgiving of those caught unprepared in the darkness. Areas that are safe to explore during the day become treacherous at night, but also reveal a beauty that those who hide from the darkness will never see. If you get stuck in the game, check out the video walkthrough and gameplay for the game. This entry was posted in Android Games, iOS Games, Mobile Games, Walkthrough and tagged Subnautica Cheats, Subnautica Gameplay, Subnautica Guide, Subnautica Hints, Subnautica Review, Subnautica Solutions, Subnautica Strategy, Subnautica Tips, Subnautica Walkthrough by Marvin. Bookmark the permalink.